Quickly form solid troops with your allies to blitz and eliminate the generated defensive bases. Considering how many versions of Art of Defense there are, it's a mystery why this is the only apparent "sequel" to the original Offensive Strike (OS). The map featured here is actually titled simply without the "II", I added that to differentiate the two. 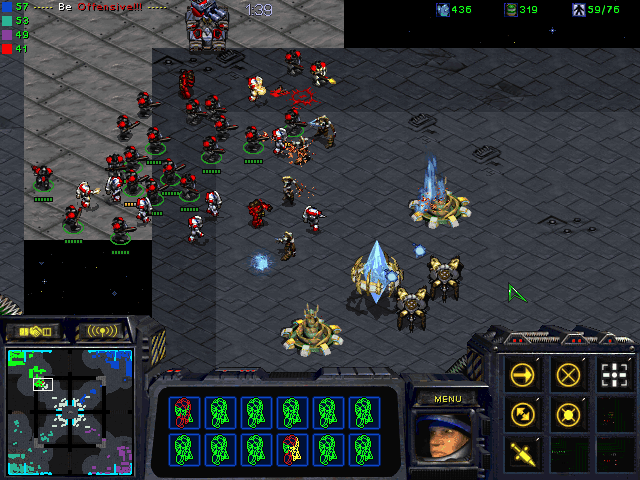 Just like the original, a melee team of four on each corner must race against the clock to train offensive units ready to attack the center where defensive computer bases are generated. OS games in particular are very teamwork oriented, if one player is not able to fully destroy his portion of the center, the rest of the team must jump in and help or the timebomb clock goes boom. At the beginning especially is where players of each race must utilize their specialties to compensate for each other. This variation, though does not emulate the puzzle levels unique to the original, still provides a faithful continuation of melee scenarios to satiate the fans of OS.